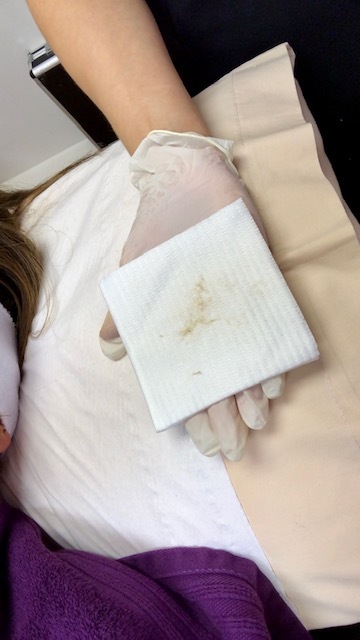 Now I'd seen a few bloggers try dermaplaning at other salons and I'm not gonna lie - I was nervous! But I trust Kerry implicitly and she assured me it would give me excellent results. 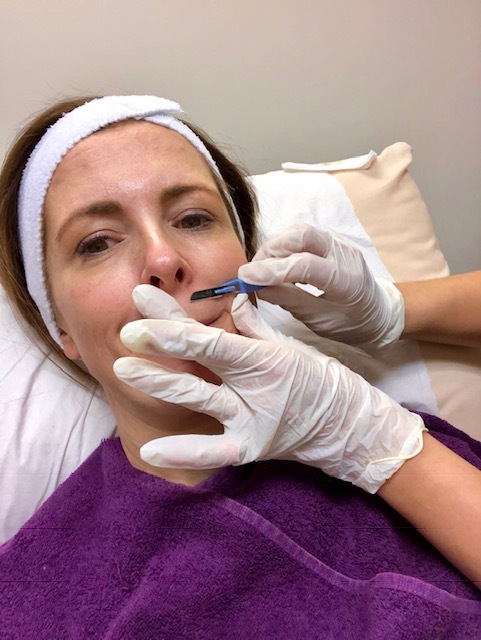 So what its dermaplaning I hear you ask? It is a safe, non-invasive treatment that removes peach fluff (technically known as villus hair) on the face. It has the added bonus of removing a superficial layer of skin cells, providing a really thorough exfoliation. 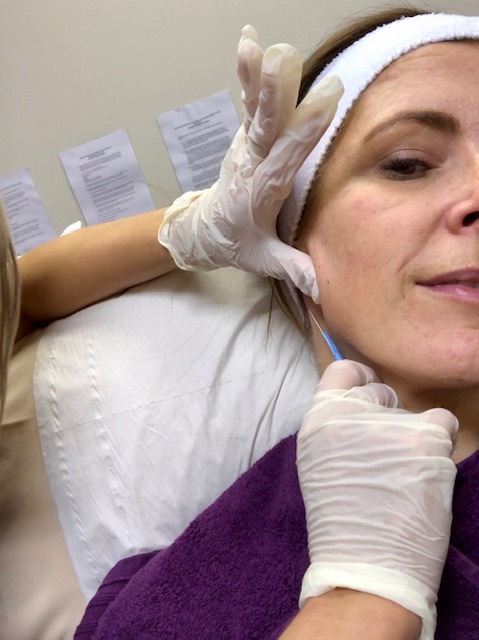 The treatment is done with a surgical blade and it leaves you with baby soft skin and a jawline that could cut you in half...well it seemed that way to me after years of having such fluffy cheeks. 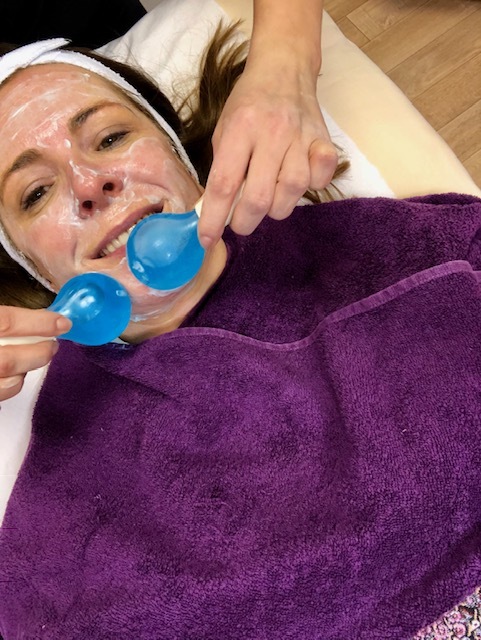 It's completely safe (obviously when done in a reputable salon) and doesn't damage the skin and should be combined for best results, with a lite refresh peel which leaves you absolutely glowing and really stimulates the skin to fire all the collagen it can at your face. I should say now that it doesn't hurt either - it's actually quite relaxing to have the treatment, especially in the capable hands of Rachael, who works with Kerry at Woodford on the Lisburn Road in Belfast. After a cleanse, Rachael went in with the blade working mainly on my cheeks, jawline and down to the hairline under my ears. The room is bright while doing this and there's a bit of moving the head around so that all the hairs are seen. I also had to sit up at the end, before the peel, for a last check over. But I know what you're wondering...I was too, throughout the treatment. WILL I END UP WITH A BEARD??! The answer is no and 8 weeks on, I can confirm this is the case. The reason is that peach fuzz is not what's called 'terminal hair'. A terminal hair is one of those little black whiskers that seem to appear out of nowhere and you only spot in your car mirror as you're about to go into an important meeting. And you forgot your tweezers. Men's beards are entirely terminal hair. But peach fuzz is a completely different type of hair and it doesn't turn into terminal hair no matter how many times you dermaplane it off. In fact...and I can attest to this, it often doesn't grow back as strong after a dermaplane treatment. Which brings me onto how I have found the regrowth after 8 weeks. I have some peach fuzz again but not as much as before. I'd say at this stage that it's about 60% of what I had. Now I may have more growth in future weeks - but as things stand, I'm really pleased with the results. Unfortunately, my 2 lovely man whiskers also grew back just like before...I have a scattering of darker ones on my top lip like most women do but I've two especially lovely ones that have the ability somehow to grow to an alarming length before I notice them. So they're still intact and being plucked as before. Would I recommend it? Absolutely. I'm not self conscious about much on my face since I stopped getting spots (still credit this to moving to Epionce though it's also probably an age thing). But I've always been aware of my fuzz and hated it. I've put up with it before now as I was terrified of the idea of removing it. I've seen bloggers and beauty salons waxing faces which absolutely terrifies me. So dermaplaning is definitely a more gentle and controlled approach....one I can get on board with. I don't think it's something that everyone needs but so many women in their 40's ask me for skincare advice because their skin is suddenly dull, tired and needs a bit of a kick up the backside. I'd say this is the perfect kick when combined with the peel. Which I reviewed previously on this link. 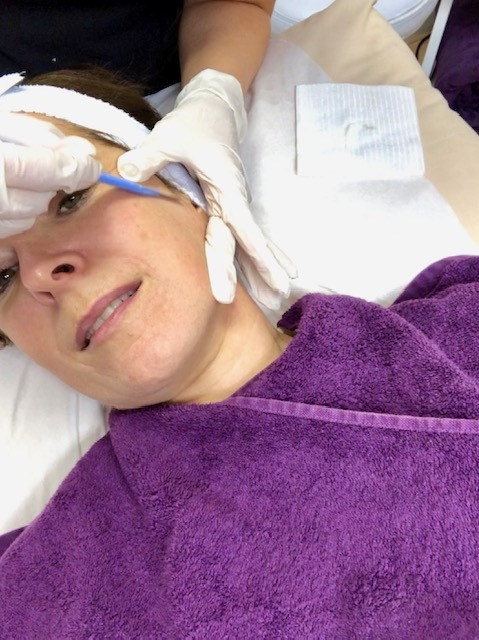 The only difference to the peel I had back then and the one combined with the dermaplaning is that the peel treatment is left on for less time as the skin has already been partly exfoliated by the blade. Oh and they use these AMAZING frozen bulbs to massage your face at the end. Bliss on your face. I walked out of that salon with my skin glowing from the inside and even now, 8 weeks on, it's still looking good. It will benefit from another peel and dermoplane within the couple of months and I'm currently setting aside cash each week for this but for now, it's doing great. One major word of caution on this - SPF. You must use SPF 50 daily after a dermaplane and a peel. Your skin is much more vulnerable after the treatment and you'll be more likely to develop pigmentation if you expose it daylight unprotected. I use the Epionce tinted SPF 50 as a primer every day under my foundation and it's still my favourite after trying many others. 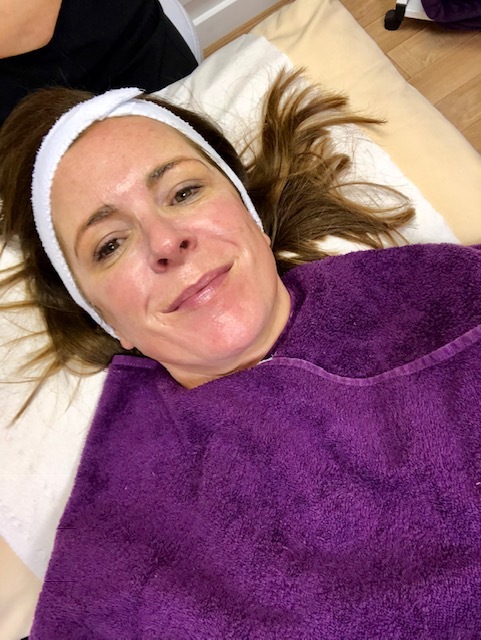 If you're local and want to find out more about Epionce or the dermaplane/peel treatment that Woodford Medical offers, you can call Kerry on 07976 630001. This isn't Kerry's personal mobile - it's the direct line mobile for the Woodford Clinic on the Lisburn Road. Kerry is a prescribing nurse with many years experience in medicine as well as aesthetics. So if you (like me) are thinking Botox might figure in the next few years, I'd strongly urge you to talk to her. I have a friend who came to Kerry after a couple of poor experiences getting generic label botox in less reputable salons and can't speak highly enough of her. And I can't believe how good it looks on her! Equally, if you're across the water, there are several Woodford Medical clinics in England - full details on their website. Disclosure - I've been purchasing product and treatments from Woodford Medical for 4 years now, becoming friends with Kerry and Dr Mervyn Patterson (co-owner of Woodford Medical) in this time. From time to time, Kerry does offer me complimentary treatments to try out the service and feed my experience back to her. I'm never under any obligation to blog but I know it's useful and informative content for readers of the blog so I have on a couple of occasions. I've never been paid by the clinic for any coverage I've given them. For me, it's about getting to know people who are excellent at their profession and that I feel 100% confident to recommend. Especially in the case of a skin clinic...and aesthetics, it's about recommending somewhere that has integrity and doesn't cut any corners in terms of qualifications, medical protocol, ingredients/products used and overall professionalism. There are SO many companies out there offering these services (and offering money for blog reviews) but I have never come across another that I can stand over to the same degree as Woodford. For that reason, you'll not see me getting similar aesthetic treatments from other clinics. Thanks for the info. I'd love to feel my face without all the peach fuzz. I'm in London so may have to do a bit of digging around to find a good salon.